This unusual R is from a plaque marking the birthplace of Alessandro dal Borro (1600–1656) in Arezzo, Italy. Dal Borro was a nobleman and highly successful general who was given the nickname “Il Terrore die Turchi” for his successes in the wars between the Ottoman Empire and the Republic of Venice. The plaque is signed A.F. Sandrelli and dated 1828. There is at least one other plaque in the exact same style of lettering in Arezzo that I have seen, though it is unsigned and undated. It honors Tommaso Sgricci (1789–1836), a “poetic improviser,” indicating that Sandrelli must have still been at work a decade or more later. Perhaps he is the Sandrelli that a local street is named after. The letters are essentially neoclassical in form and stroke contrast, but the serifs are slightly triangular, indicating the influence of the French following the Napoleonic Wars. What is odd, though about the R is the shape of the leg. 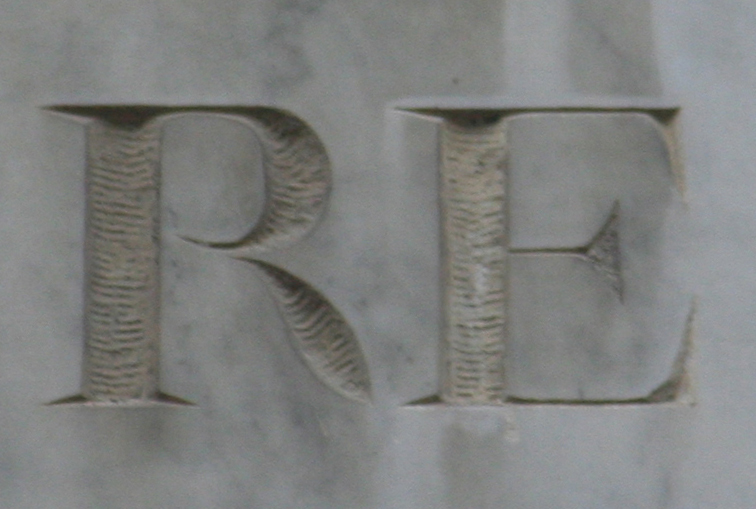 The swelling stroke is typical of pointed pen writing, but not something one sees very often in inscriptions and certainly not for the leg of R. A similar stroke appears as the tail of Q in the plaque. These two letters are enough to enliven the plaque, taking it out of the realm of dullness that affects so many inscriptions carved in the neoclassical style.